Why rent a car in Spain? Spain is a fun destination to discover by car. A diverse country that is home to different unique regions and landscapes, it would be a waste to limit your travels here to just one corner of it. Although the country is quite large, the road network is in good shape and it’s easy to visit different cities, regions, and nature attractions on the same trip. This article is about the mainland Spain. For information about Mallorca and other Balearic Islands, see the article of Balearic Islands. For information about Canary Islands, see the article of Spain-Canary Islands. Barcelona-El Prat Airport: The main airport of Catalonia region serves flights to and from countless destinations in Europe, as well as the Americas, Africa, and Asia. Malaga Airport: The main hub not only for Malaga, but also for the rest of Andalusia and Southern Spain. Madrid Barajas Airport: Spain’s largest airport is one of the busiest in Europe, serving more than 50 million passengers per year. Alicante Airport: Modern yet cozy, Alicante Airport is popular with low-cost airlines and offers access to the wider Valencian Community. By land: If your rental car provider permits it, it’s possible to rent a car in a neighboring country and then drive to Austria. Some large international airports near Austria are Lisbon Airport and Porto Airport in Portugal, as well as Nice Airport and Bordeaux Airport in France. Barcelona: Home to everything from iconic architecture to delicious cuisine, grand history, and sandy beaches, the real attraction of Barcelona is its atmosphere as this city truly is more than the sum of its parts. Madrid: Busy yet classy, Madrid has the grandeur of a true metropolis, and is home to distinct neighborhoods, countless landmarks, world-famous art museums, and lively culture scene. 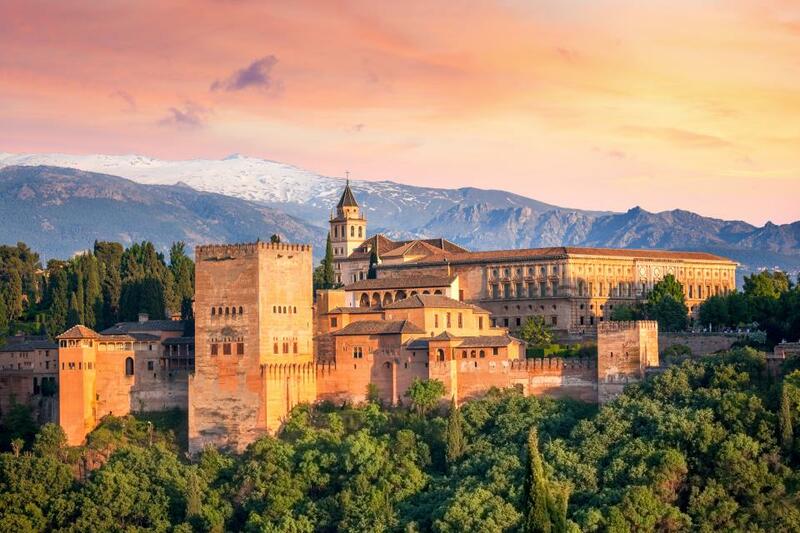 Andalusia: Many travelers know Andalusia best for its extensive Mediterranean and Atlantic Coast, but its wild nature areas, as well as stunning historic cities Granada and Cordoba that still hold traces of its Moorish past deserve just as much attention. Basque Coast: Bordering France in the northeastern corner of Spain, the Basque Coast is home to a proud culture, beautiful cities like San Sebastian and Bilbao, fantastic food, and rugged Biscay Coast. Galicia: Culturally related to their next door Portuguese neighbors and with a terrain that some think resemble Scotland more than Barcelona, Galicia is a unique destination. Less busy than some other regions of the country and beautifully green, it is best enjoyed at a relaxed pace. The most popular rental car in Spain is the Ford Fiesta, but travelers tend to also choose the Fiat 500 and the Ford Focus a lot. Spain is bordered by Portugal, France, and Andorra. Like Spain, Portugal and France are members of the Schengen Area, so the same entry requirements that apply for Spain will also be in place to enter these other two countries. Andorra is not a member of Schengen Area, but its entry requirements are, in practice, the same as those for entering Schengen members. The autonomous cities of Ceuta and Melilla are part of Spain, but are physically located in North Africa and bordered by Morocco. Morocco is not a member of the Schengen Area and has its own visa policy. Depending on your citizenship, you may or may not need a visa to enter it. We strongly advise getting in touch with your Ministry of Foreign Affairs in advance to find out if you need a visa to visit Morocco. The most popular rental car type in Spain is an Economy, followed by compact and mini. Barcelona - Madrid (624 km / 388 mi) The route between the Spain’s two largest cities can be done in about six hours and will take you through rural areas of Catalonia, Aragon, and Castile-la-Mancha, parts that are not often visited by international tourists, but are fascinating to explore. Malaga - Lisbon (672 km / 417 mi) The route from Andalusia to Portugal’s capital is best done at the leisurely pace, giving yourself plenty of time to explore Spain’s south as well as beautiful regions of Algarve and Alentejo across the border. Barcelona - Rome (1,361 km / 846 mi) A surprisingly large number of travelers choose to go from Barcelona all the way to the capital of Italy, visiting Occitanie and Provence in France, as well as the Italian regions of Liguria and Tuscany on the way. Note that you’ll have to cross two national borders, so check with your car rental provider first to make sure they allow it. If you’d like to enter the Principality of Monaco, a sovereign micro-state that is on the way, you can do see with a Schengen Visa. Visit on the month when the rental prices are the cheapest. According to our data, visiting Spain is the cheapest in June when renting a car is about 27% cheaper than the yearly average and 40% cheaper than renting a car in July. Which is the cheapest month to rent a car in Spain? The cost of renting a car in Spain depends on the time of year. This graph compares price changes from month to month in order to find the best offer. The cheapest month of the year to rent a car in Spain is June — prices start from $26.29 for an Economy class vehicle. This is 30% cheaper than the year’s average and 40% cheaper than renting a car in the month of February (when prices start at $43.80 for a Compact class). This information can help you identify the low season. But these are only average numbers. The exact price for your trip will depend on the length of your rental and the number of days until your rental period begins. Just enter your dates in the form at the top of the page to see exact prices and offers. What’s the average rental length in Spain? Average length differs from month to month. The longest rental periods are in January — an average of 7 days. The shortest are in October — an average of 4 days. What’s the most popular time for renting a car in Spain? Discover Car Hire users search a lot of locations daily. We gathered this information in order to analyze car rental popularity in Spain. The most popular month is July, while the least popular is December.